You may be looking for other uses of the word heretic. "Our Prophets are false! Open your eyes, my brothers! They would use the faith of our forefathers to bring ruin to us all!" A heretic faction led by Sesa 'Refumee broke away from the Covenant shortly after the Battle of Installation 04. Denouncing the Prophets' religion, they came to be regarded as heretics and were considered a substantial threat to the Covenant. The Hierarchs sent Arbiter Thel 'Vadamee to eliminate the secessionists before their message could spread and undermine the public faith in the Great Journey. The faction was originally an artifact retrieval team attached to the Fleet of Particular Justice. Led by Sesa 'Refumee and Loka 'Bandolee, they were dispatched by the Prophet of Stewardship to investigate a gas mine above the planet Threshold when the UNSC Pillar of Autumn crashed on Halo Installation 04. The team survived the Halo's destruction at the hands of Spartan John-117, unlike the majority of the Covenant forces who had failed to evacuate the system. Shortly afterwards, the retrieval team came into contact with the monitor of Installation 04, 343 Guilty Spark, who had traveled to the gas mining facility. After a brief confrontation with several Unggoy and Kig-Yar, their Sangheili leader recognized the monitor as an "Oracle" and took him to the group's leader per the monitor's request. Guilty Spark cheerfully informed 'Refumee of the true purpose of the Halo Array, utterly destroying his and his team's faith in the promised "Great Journey". 'Refumee then ordered all communications with the fleet to be severed until the Oracle could fully explain the matter. Disillusioned with the lies of the Hierarchs and their Great Journey, 'Refumee initiated an open rebellion against the Covenant's San'Shyuum leadership. He secretly dispatched holographic recordings to other Sangheili about the true purpose of the Halos. In the meantime he strengthened the defenses of the gas mine, fortifying it with plasma cannons and a large complement of Banshee attack craft in anticipation of the Covenant's retribution for his heresy. He also had at least one Seraph starfighter in the mine's docking bay. In addition, the group was supported by the Sentinels based in the gas mine, under the command of 343 Guilty Spark. It is unclear how many more Covenant members 'Refumee was able to sway to his cause. Eventually, 'Refumee's activities were discovered by the Hierarchs, who decided to quell the heresy using two former commanders of the Fleet of Particular Justice: the disgraced Supreme Commander Thel 'Vadamee, now the Arbiter, and Special Operations Commander Rtas 'Vadumee. Whilst inhabiting the mine, the faction discovered that the facility had a secondary purpose: a Flood research facility was built into the mine as part of the Forerunners' attempt to find a way to destroy the Flood. The Arbiter and 'Vadumee arrived at the facility with orders to annihilate all heretics. Accompanying them were three Phantoms full of Special Operations Sangheili and Unggoy, fighting through a large contingent of heretic soldiers whilst chasing 'Refumee throughout the facility. Whether by accident or design, the heretics released the Flood upon themselves shortly before or during the Arbiter's arrival, creating a deadly triangle of conflict as all sides attempted to destroy the others. Despite heavy resistance from heretic forces and the Flood, the Arbiter was able to assassinate 'Refumee and destroy the gas mine completely by severing the support cables maintaining the facility's position. This was a crippling blow to the faction. It is possible, though unlikely, that some survived, as they operated a makeshift compound on Threshold's moon, Basis. 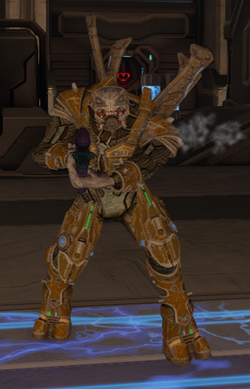 A Sangheili heretic with a Type-51 carbine. Sesa 'Refumee's group was equipped with non-standard armor, colored golden-beige and differing in design from normal Covenant armor. After they split from the Covenant, they donned the colors of Sangheilios. The Sangheili did not wear helmets, but were instead equipped with respirators and goggles to help them survive in the hydrogen-helium atmosphere of Threshold. Their armor was more ornate than the typical glossy armor worn by most Covenant forces, and their harnesses had four distinctive fins on the back. The methane tanks used by the Unggoy consisted of two translucent tubes. The Kig-Yar assigned to 'Refumee's artifact retrieval team wore similar harnesses. Sesa's group used several Type-26AZ Banshee's often associated with select artifact-hunting fleets, though they removed the Covenant manufactured cowlings from their Banshees revealing the Forerunner mechanisms beneath, and redesigned them so they sport the colors of Sanghelios. Unlike most Sangheili warriors in the Covenant, very few Sangheili in the heretic faction (aside from Sesa 'Refumee himself and Banshee operators) wielded Type-25 plasma rifles. The majority instead opted to use Type-51 carbines as their standard weapon of choice. Others made use of Type-33 needlers and even Sentinel beams. The faction's Sangheili did, however, continue to use Type-1 energy swords as normal. Heretic Unggoy were similarly nonstandard, nearly all equipping themselves with Type-33 needlers while a few used Type-33 fuel rod guns. This style of armament was a radically different to Unggoy within the Covenant who typically used Type-25 plasma pistols. Early concepts for the faction consisted solely of Mgalekgolo. Sesa Refumee, the leader of the faction. Concept art for heretic Unggoy for Halo 2: Anniversary. A heretic Unggoy in Halo 2. Heretic Unggoy in Halo 2. Heretic Unggoy in Halo 2: Anniversary. A heretic Kig-Yar, armed with a plasma pistol. A heretic Sangheili Major with an energy sword in Halo 2. A heretic Sangheili Major with a Sentinel beam in Halo 2. A heretic Sangheili Major in Halo 2: Anniversary. A heretic Sangheili Major with an energy sword in Halo 2: Anniversary. A Seraph fighter in the heretics' hangar in the gas mine in Halo 2. Model used for the Seraph fighter in Halo 2 Anniversary. A T-26AZ Banshee being used by the heretics. The Halo 2: Anniversary version of the Banshee used by the heretics.